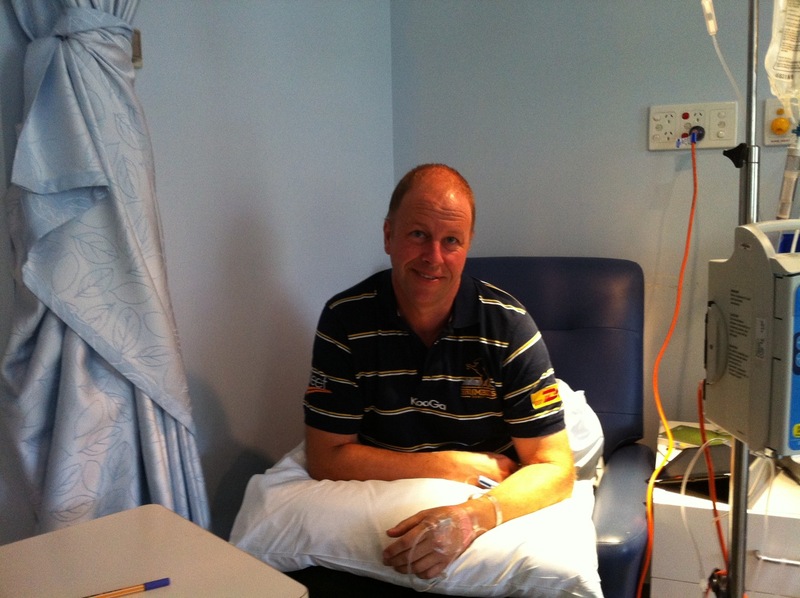 I spent Tuesday in hospital getting my final ‘full-dose’ chemo treatment. Apparently, limiting this treatment to 4 cycles is the optimum and, if the cancer is not advancing, then they intend to keep me on a 3 weekly ‘maintenance’ chemo plan. This is supposed to reduce the impact of side effects, while preventing the cancer from growing or spreading further. The medical expectation is that the cancer will grow again at some point, and then I will be offered other options. We are hoping to be able to access a specially targeted drug, called Crizotinib, which is showing very good results in people with my specific cancer mutation. This should be available if there is evidence that the tumour is growing again – a bit of a Catch 22 really! But all this lies ahead of us. The comment you sent to me via Facebook about dark times and tears made me realize the deep personal struggle you are going through. Just wanted to encourage you to dip into that more as you write, because it counts for a lot. My feeling is that most people live in that realm, whether they have cancer or not. While the analogy doesn’t directly apply, I think it conveys the point: life is more Daily Telegraph than Sydney Morning Herald… or worse still! I’ve been reflecting on this a bit. My desire is not to continually focus on myself as I write this blog. But I am seeking to be a blessing to others and that means being honest about the ups and downs. Not that everything needs to get said, and not that everything should be revealed in a public forum, but I will share a bit about the dark times. On my first day in hospital, hearing that I likely had cancer a was huge thing. No one wants to hear the words tumour or cancer, and certainly not about themselves or someone they love. Tears welled up instantly, feelings of massive loss, fears for my kids, and my wife… they all flooded in. Seeing the tears in the eyes of my family and the friends who came to visit added to the pain. We were dealing with a bombshell and it was so hard. My time in hospital was supposed to be pretty straightforward. Drain the fluid, be out in a few days. I even remember telling our church staff that I should be right to speak the following weekend! But it didn’t go to my plan. I got sicker and weaker. Instead of my health improving, I just seemed to go backwards. At times I couldn’t even walk to the bathroom, or adjust my posture in bed. It was an effort to breath, painful to yawn and cough (let alone sneeze), and hard to talk with people when hooked up to oxygen. My digestive organs decided to shut up shop and 10 days of constipation resulted in violent vomiting. Immediately after one vomiting episode I was taken for a chest x-ray (why it had to be right then I do not know!) where I collapsed, resulting in an emergency team rushing to my aid. I started to think I wasn’t going to make it out of hospital. My ignorance of medical things also added to my fears. On one occasion I saw my chest x-rays while they were being processed. I only had one functioning lung – the other had collapsed! I honestly thought, this meant I didn’t have much hope. For some reason, I assumed that I needed two good lungs to be able to breathe. Fiona set me straight on this and also pushed me to work hard on breathing exercises to get the lung re-inflated! On one occasion they changed my drugs and this led to hallucinations. I don’t think I’d experienced this before. Dreams that you can’t turn off, even with your eyes wide open. It was a long, lonely, scary night being faced with weird and frightening experiences coming one after another. Perhaps, the hardest experience in hospital was my first contact with the oncologist and his team. Up until their visit, things had focused pretty much exclusively on the surgery and the chest drains, and I hadn’t had to think too much about the cancer. This changed dramatically, as I was quickly told that that my cancer was incurable. I didn’t understand why they weren’t offering me hope of a cure (or for that matter why I needed to be told this on a first consult and without Fiona present), but this news was devastating! Being faced with my mortality has led to some very sad times. In my weakness, sometimes I have become sullen, grumpy, melancholic, perhaps even depressed. I’ve often grieved what I may never be able to do, the loss of time with family and friends, not being able to do a lot of the fun things people do with their kids, or thinking of life events I may never be a part of. There have been times when I’ve felt a burden and useless, and thoughts have turned to thinking people would be better off without me. I’ve been reduced to tears – uncontrollable sobbing, overwhelmed, sometimes crying out in agony, God please help me! Fiona has been fantastic at urging and helping me not to slide into self-obsession or depression. And I’ve asked a couple of friends to keep an eye on me too. I don’t want to go on and on in this vein but I must say that there’ve been some times when the struggle has been deeply spiritual. God has seemed very remote. His plans and purposes for me have been very unclear. I’ve had days where I’ve seriously questioned his existence, or the truthfulness of the gospel message. Does God love me, care for me? Can I trust him with my life, my death, my future, my family? Isn’t it a bit weird to base my confidence on the Bible, written so many hundreds of years ago? Did Jesus live? Was he crucified? Did he actually rise again from the dead? Is he alive today? Such ideas can seem pretty weak and foolish, and not exactly a confident platform to stake my life on. I’ve found myself going back to the Bible and reading things over again. I’ve looked at interviews with leading historians and Biblical scholars. I’ve weighed up some of the critiques and arguments of sceptics and naysayers. And I’ve searched my heart. And in doing this, I’ve been encouraged to keep trusting in God and his promises. Over the years a few Bible verses have spoken to me in the midst my struggles and doubts. Let me share a couple. The first is the response of a father, hoping that Jesus can help his son, where he says in Mark 9:24, “I believe; help my unbelief!” I’ve often identified with this man. Those who’ve told me it’s the strength, or otherwise, of my faith that will determine whether God will act (or even can act) need to reread this verse and see Jesus’ compassion in response to the man’s wavering. It’s not my faith that compels God to act. Rather it is God’s faithfulness to his character and promises that leads me to keep trusting in him. Another part of the Bible I’ve found helpful comes from an incident after the resurrection. Jesus had recently appeared to many of his followers, but Thomas wasn’t with them, and he was unpersuaded that Jesus had really been raised from the dead. We read of this in John 20:24-29. Hence, Thomas becomes the disciple famous for doubting. Maybe you can relate to this too. But it’s the next comment from Jesus that has always given me encouragement and hope. Jesus understood it was hard for Thomas to be persuaded, but he also acknowledged that it would be hard for all who came after him. We sometimes say seeing is believing, but when we’re dealing with history before cameras and video, it becomes more a case of reading or hearing is believing. This doesn’t make it less true, it just means that our evidence is in a different form to that offered to Thomas. We get it as a record from the first eye, ear and hand witnesses, that has been recorded and passed on to us. Just because I wasn’t there doesn’t mean it didn’t happen. I’ve also gone back over some of the Psalms from the Old Testament. Many of these are are open and honest accounts of people who are struggling to trust God in their difficult circumstances. Sometimes they question and challenge God. Sometimes they plead with God to do something about their circumstances. Sometimes they call for justice or mercy from God. What has struck me personally is that the writers are not afraid to let God know their thoughts and feelings, even when they are unhappy with God. They grapple with their struggles, but then they remind us of the way forward. Hope is not ultimately found in improving their condition or circumstances, but by resting in the trustworthy promises of God. If God were strong but not loving, then he would be nothing less than a danger to everyone. If he were loving but not strong, then he could offer us sentiment but no help. The Bible affirms he is both strong and loving, infinitely so, and it is here that we find our true hope. I need look nowhere else. My experience of God is that he is both strong and loving. And I see this most clearly and persuasively in the death and resurrection of Jesus, where he paid the cost for my rebellion and offered me life for eternity. Thanks Macca. I’m a cry-baby from way back – subcontinental thing I guess! – but that was brave and generous and honest and Christ-exalting. You’ve filled my eyes with tears and my heart with thanks and hope in a strong and loving God. Praying for you all. Wonderful Dave. Thanks for that life-giving blog. I particularly appreciated your retelling of the Thomas story and how that spoke to you. Blessings from Vancouver. No but we want you to, brother. Not in the sense that we enjoy watching pain, especially you in the middle of it, but because you see things now from a situation that not many of us have yet gone through. Thank you for pointing us to Christ from the place you’re sitting in! Thanks, Dave. You continue to be such an encouragement in your pain. Thanks brother. Real Life in the midst of real life. Praying for your healing and ever-growing trust and hope in the Resurrected Christ, the Lord, Jesus. Thanks Macca. Thanks so much for sharing. Please continue to write what is in your heart. I am not sure if this helps, but very good Australian friends of mine had shared with me that it is okay. It is okay to be angry because God knows my soul. God knows your soul. God knows you are a beautiful person. You can focus on what your heart leads you to focus because you have everyone who loves you praying for you and lifting you up to God. I am overwhelmed by your willingness to share your experiences. Hugs and blessings to you. Huge Dave – be encouraged to keep writing, the format of blog installments gives a balance of reflection and being in the moment. It’s shaping into a resource to point others to, and a gospel demonstration as well as proclamation. Love you guys. We’re so proud of you and joyful when we think of you.